Two fellow mic fanatics in the past week have asked how they might help out with the Microphone Database project. One of them inspired me to come up with a quick solution, so here it is — a spreadsheet template. (Yes, this is your father’s content-management system.) 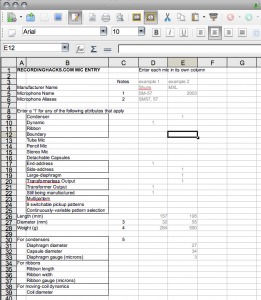 I can import data from this sheet into the database pretty easily. Every mic submitted this way will get priority treatment. So, if you’re wishing your favorite mic was included in the RecordingHacks Mic Database, grab this form, fill it out, and send it to me (see the Contact page). The Database is great, but where the hell is the search function? So many times I know what mic I want to see specs for, I wanna go right to it! Thank you for your efforts Matthew. Jon, I just added a name-search function. It’s at the top of the Search form in the sidebar of the microphone pages. Enjoy! Man I very luckily came across the microphone database and I am floored. I have been a microphone freak for ages and have always dreamed of something like thing. GREAT WORK !